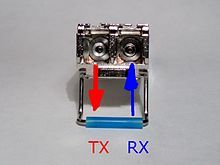 Small Form-factor Pluggable connected to a pair of fiber optic cables. An SFP interface on networking hardware is a modular (plug-and-play) slot for a variable, media-specific transceiver in order to connect a fiber optic cable or sometimes a copper cable. SFP transceivers exist supporting SONET, Gigabit Ethernet, Fibre Channel, and other communications standards. At introduction, speeds were limited to 1Gib/s, but the published SFP28 iteration is designed for speeds of 25 Gbit/s. The SFP replaced the larger GBIC in most applications, and has been referred to as a Mini-GBIC by some vendors. A slightly larger sibling is the four-lane Quad Small Form-factor Pluggable (QSFP). The additional lanes allow for speeds 4 times their corresponding SFP. The latest published variant is QSFP28 variant allowing speeds up to 100 Gbit/s. There are inexpensive adapters allowing SFP transceivers to be placed in a QSFP port. Both a SFP-DD, which allows for 100 Gbit/s over two lanes, as well as a QSFP-DD specifications, which allows for 400 Gbit/s over eight lanes, have been published. These use a formfactor which is backwardly compatible to their respective predecessors. An alternative competing solution, the OSFP (Octal Small Format Pluggable) transceiver is also intended for 400Gbps fiber optic links between network equipment via 8 x 50 Gbps electrical data lanes. It is slightly larger version than the QSFP formfactor which is capable of handling larger power outputs. The OSFP standard was initially announced on November 15, 2016. Its proponents say a low cost adapter will allow for QSFP module compatibility. SFP transceivers are available with a variety of transmitter and receiver specifications, allowing users to select the appropriate transceiver for each link to provide the required optical reach over the available optical fiber type (e.g. multi-mode fiber or single-mode fiber). Transceivers are also designated by their transmission speed. SFP modules are commonly available in several different categories. SX – 850 nm, for a maximum of 550 m at 1.25 Gbit/s (gigabit Ethernet). Other multi-mode SFP applications support even higher rates at shorter distances. CWDM and DWDM transceivers at various wavelengths achieving various maximum distances. CWDM and DWDM transceiver usually support 40 km, 80 km and 120 km link distance. Although it is not mentioned in any official specification document the maximum data rate of the original SFP standard is 5 Gbit/s. This was eventually used by the DDR Infiniband especially in its four lane QSFP form. SFP+ also introduces direct attach for connecting two SFP+ ports without dedicated transceivers. Direct attach cables (DAC) exist in passive (up to 7 m), active (up to 15 m), and active optical (AOC, up to 100 m) variants. 10 Gbit/s SFP+ modules are exactly the same dimensions as regular SFPs, allowing the equipment manufacturer to re-use existing physical designs for 24 and 48-port switches and modular line cards. In comparison to earlier XENPAK or XFP modules, SFP+ modules leave more circuitry to be implemented on the host board instead of inside the module. Through the use of an active electronic adapter, SFP+ modules may be used in older equipment with XENPAK ports  and X2 ports. SFP+ modules can be described as limiting or linear types; this describes the functionality of the inbuilt electronics. Limiting SFP+ modules include a signal amplifier to re-shape the (degraded) received signal whereas linear ones do not. Linear modules are mainly used with the low bandwidth standards such as 10GBASE-LRM; otherwise, limiting modules are preferred. SFP28 is a 25 Gbit/s interface which evolved from the 100 Gigabit Ethernet interface which is typically implemented with 4 by 25 Gbit/s data lanes. Identical in mechanical dimensions to SFP and SFP+, SFP28 implements one 28 Gbit/s lane accommodating 25 Gbit/s of data with encoding overhead. SFP28 modules exist supporting single- or multi-mode fiber connections, active optical cable and direct attach copper. The compact small form-factor pluggable (cSFP) is a version of SFP with the same mechanical form factor allowing two independent bidirectional channels per port. It is used primarily to increase port density and decrease fiber usage per port. The small form-factor pluggable double density (SFP-DD) multi source agreement is a new standard for doubling port density. According to the SFD-DD MSA website: "Network equipment based on the SFP-DD will support legacy SFP modules and cables, and new double density products." Quad Small Form-factor Pluggable (QSFP) transceivers are available with a variety of transmitter and receiver types, allowing users to select the appropriate transceiver for each link to provide the required optical reach over multi-mode or single-mode fiber. The original QSFP document specified four channels carrying Gigabit Ethernet, 4GFC (FiberChannel), or DDR InfiniBand. QSFP+ is an evolution of QSFP to support four 10 Gbit/sec channels carrying 10 Gigabit Ethernet, 10GFC FiberChannel, or QDR InfiniBand. The 4 channels can also be combined into a single 40 Gigabit Ethernet link. The QSFP28 standard is designed to carry 100 Gigabit Ethernet, EDR InfiniBand, or 32G Fibre Channel. Sometimes this transceiver type is also referred to as "QSFP100" or "100G QSFP" for sake of simplicity. QSFP56 is designed to carry 200 Gigabit Ethernet, HDR InfiniBand, or 64G Fibre Channel. The biggest enhancement is that QSFP56 uses PAM-4 encoding instead of NRZ. As of April 2019[update], this new standard has not been published, but transceivers already are in use. It uses the same physical specifications as QSFP28 (SFF-8665), with electrical specifications from SFF-8024 and the still unpublished revision 3.0 of SFF-8636. Sometimes this transceiver type is referred to as "200G QSFP" for sake of simplicity. Switch and router manufacturers implementing QSFP+ ports in their products frequently allow for the use of a single QSFP+ port as four independent 10 gigabit ethernet connections, greatly increasing port density. For example, a typical 24-port QSFP+ 1U switch would be able to service 96x10GbE connections. There also exist fanout cables to adapt a single QSFP28 port to four independent 25 gigabit ethernet SFP28 ports (QSFP28-to-4×SFP28) as well as cables to adapt a single QSFP56 port to four independent 50 gigabit ethernet SFP56 ports (QSFP56-to-4×QSFP56). SFP sockets are found in Ethernet switches, routers, firewalls and network interface cards. Storage interface cards, also called HBAs or Fibre Channel storage switches, also make use of these modules, supporting different speeds such as 2Gb, 4Gb, and 8Gb. Because of their low cost, low profile, and ability to provide a connection to different types of optical fiber, SFP provides such equipment with enhanced flexibility. However, as a practical matter, some networking equipment manufacturers engage in vendor lock-in practices whereby they deliberately break compatibility with "generic" SFPs by adding a check in the device's firmware that will enable only the vendor's own modules. Third-party SFP manufacturers have introduced SFPs with "blank" programmable EEPROMs which may be reprogrammed to match any vendor ID. Front view of SFP module with integrated LC connector. The blue extraction lever indicates the module is designed for use with single-mode optical fiber. OC-3 SFP internal. The top, metal canister is the transmitting laser diode, the bottom, plastic canister is the receiving photo diode. 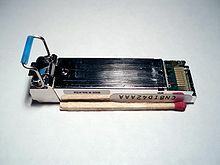 The SFP transceiver contains a PCB with 20 pads that mates on the rear with the SFP electrical connector in the host system. QSFP has 38 pins including 4 high-speed TX pairs (CML-I) and 4 high-speed RX pairs (CML-O). Side view of SFP module (length is 6 cm). The physical dimensions of the SFP transceiver (and its subsequent faster variants) are narrower than the later QSFP counterparts, which allows for SFP transceivers to be placed in QSFP ports via an inexpensive adapter. Both are smaller than the XFP transceiver. The SFP MSA defines a 256-byte memory map into an EEPROM describing the transceiver's capabilities, standard interfaces, manufacturer, and other information, which is accessible over an I²C interface at the 8-bit address 1010000X (A0h). Modern optical SFP transceivers support standard digital diagnostics monitoring (DDM) functions. This feature is also known as digital optical monitoring (DOM). Modules with this capability enable the end user to monitor parameters of the SFP, such as optical output power, optical input power, temperature, laser bias current, and transceiver supply voltage, in real time. This functionality is commonly implemented for monitoring on routers, switches and optical transport equipment via SNMP. A DDM interface allows end users to display diagnostics data and alarms for fiber optical transceivers and can be used to diagnose why a transceiver optics is not working, increasing popularity of transceiver optics with DDM. Generally, the transceiver vendor sets the thresholds that trigger a high alarm, low alarm, high warning, or low warning before shipment. In order to be able to take advantage of DDM/DOM capability, most of the modern pluggable transceiver optics support DDM/DOM interfaces. ^ Besides the data rate, the major difference between 8 and 16 Gbit/s Fibre Channel is the encoding method. 64b/66b encoding used for 16 Gbit/s is a more efficient encoding mechanism than 8b/10b used for 8 Gbit/s, and allows for the data rate to double without doubling the line rate. The result is a 14.025 Gbit/s line rate for 16 Gbit/s Fibre Channel. 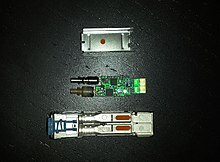 Wikimedia Commons has media related to Small Form-factor Pluggable. ^ "SFP Definition from PC Magazine Encyclopedia". www.pcmag.com. Retrieved May 10, 2018. ^ "SFF-8402: SFP+ 1X 28 Gb/s Pluggable Transceiver Solution (SFP28)". 1.9. SNIA SFF Committee. September 13, 2014. Retrieved March 26, 2019. ^ "Cisco MGBSX1 Gigabit SX Mini-GBIC SFP Transceiver". Retrieved March 25, 2018. ^ a b "SFF-8665: QSFP+ 28 Gb/s 4X Pluggable Transceiver Solution (QSFP28)". 1.9. SNIA SFF Committee. June 29, 2015. Retrieved March 26, 2019. ^ "Lightwave Online news article re: 400Gb". ^ "PROLINE 1000BASE-SX EXT MMF SFP F/CISCO 1310NM 2KM - SFP-MX-CDW - Ethernet Transceivers". CDW.com. Retrieved January 2, 2017. ^ "Single-fiber single-wavelength gigabit transceivers". Lightwave. Retrieved September 5, 2002. ^ "The principle of Single Wavelength BiDi Transceiver". Gigalight. Archived from the original on April 3, 2014. ^ "Fiberstore: 100 M SFPs". ^ "FAQs for SFP+". The Siemon Company. August 20, 2010. Retrieved February 22, 2016. ^ "SFF-8431 Specifications for Enhanced Small Form Factor Pluggable Module SFP+ Revision 4.1" (PDF). July 6, 2009. Retrieved March 16, 2017. ^ Tektronix (November 2013). "Characterizing an SFP+ Transceiver at the 16G Fibre Channel Rate". ^ "10-Gigabit Ethernet camp eyes SFP+". LightWave. April 2006. ^ "SFP+ to XENPAK adapter". ^ "10GBASE X2 to SFP+ Converter". ^ Ryan Latchman and Bharat Tailor (January 22, 2008). "The road to SFP+: Examining module and system architectures". Lightwave. Retrieved July 26, 2011. ^ "Ethernet Summit SFP28 examples" (PDF). ^ "Cisco SFP28 product examples". ^ "SFP28 LR 1310nm transceivers". ^ "SFP28 850nm example product" (PDF). ^ "25GbE SFP28 Active Optical Cable" (PDF). Mellanox. Retrieved October 25, 2018. ^ "Intel Ethernet SFP28 Twinaxial Cables" (PDF). Retrieved October 25, 2018. ^ "Cisco SFP28 direct attach cables" (PDF). ^ "Compact SFP, Compact SFF MSA group forms". Lightwave. February 20, 2008. Retrieved April 12, 2018. ^ "Introducing Compact Small Form-Factor Pluggable Module (Compact SFP)". Cisco Systems. Retrieved January 12, 2019. ^ a b c d SFF Committee. "QSFP Public Specification (INF-8438)" (PDF). SFF Committee. p. 12. Retrieved June 22, 2016. ^ a b SFF Committee. "QSFP+ 10 Gbs 4X Pluggable Transceiver (SFF-8436)" (PDF). p. 13. Retrieved June 22, 2016. ^ SFF Committee. "QSFP+ 14 Gb/s 4X Pluggable Transceiver Solution (QSFP14)" (PDF). p. 5. Retrieved June 22, 2016. ^ "Arista "100G Optics and Cabling Q&A Document"" (PDF). www.arista.com. Arista Networks, Inc.
^ "Mellanox MMA1T00-VS: 200GbE QSFP56 MMF Transceiver datasheet" (PDF) (rev 1.32 ed.). Mellanox. March 6, 2019. Retrieved April 4, 2019. ^ "SFF-8024: Management Interface for Cabled Environments". 4.6. SNIA SFF Committee. February 14, 2019. Retrieved April 4, 2019. ^ "Working Draft SFF-8636 Rev 2.9.2 Management Interface for Cabled Environments". 2.9.2. SNIA SFF Committee. July 27, 2018. Retrieved April 4, 2019. ^ "Arista 400G Transceivers and Cables: Q&A" (PDF). www.arista.com. Arista Networks, Inc. Retrieved April 4, 2019. ^ "Cisco Nexus 5600 specifications". ^ "Finisar 4 x 10GbE fanout QSFP". ^ "Arista 40Gb port to 4 x 10GbE breakout" (PDF). ^ "QSFP56 : 4-2334236-1 Pluggable I/O Cable Assemblies". TE Connectivity. ^ John Gilmore. "Gigabit Ethernet fiber SFP slots and lock-in". Retrieved December 21, 2010. ^ "INF-8077i: 10 Gigabit Small Form Factor Pluggable Module" (PDF). Small Form Factor Committee. August 31, 2005. Retrieved March 16, 2017.